Make a romantic statement with these handmade earrings, made from antique lace dipped in gold. 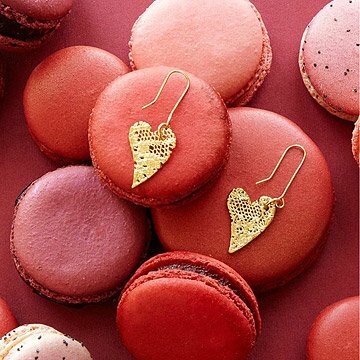 Bring a sweetly romantic statement to your ensemble with Tulianna and Alejandra Garces's heart-shaped earrings that combine the timeless qualities of lace and gold. Through an intricate process that can take several days, Colombian artisans transform lace into stunning, finely detailed jewelry. The process is entirely done by hand: pieces of lace are cut and sewn, dipped in wax to seal and reinforce them, then in a layer of copper, and finally in 24k gold. The piece is then brushed by hand, clearing every void of the lace from excess metal to preserve its subtle detail. Finally, a lacquer is brushed onto each piece to protect its delicate beauty. The resulting pieces are glittering tributes to the traditional art of lacemaking, and gorgeous statements to add to your collection. Handmade in Colombia. As with any fine piece of jewelry, please don't keep in sealed plastic bags, don't get wet, or use any chemical cleaners, or perfumes or creams. If it gets wet, please air dry, or pat dry with a soft cloth. Beautiful earings! I bount 2 pairs as gifts for my sider, who has 2 wonderful daughter, and for my best freind, whose daughter in my daughter's bestie. I look for gifts from small, women-owned businesses in the US and 3rd world country every year, and sustainable if possible. They do the same. These earrings look so delicate and have a soft shine when they catch the light. I love the story behind Tulianna and Alejandra Garces and want to support women, such as themselves, in helping spread the idea of sustainable, eco-friendly products. Not too delicate and not too large either which were my two main concerns when getting this gift! They're great! Very happy about this product! Mom gets compliments every time she wears them!! My friend really liked them! I never saw them in person. I mostly wear it every day for work. I love hearts and I like the size and delicate look. Was a little disappointed that most all the holes of the lace are covered in the gold - would have liked a bit less gold to add to the abstract art of the design. She wears these with the matching necklace. They are even nicer than I expected.